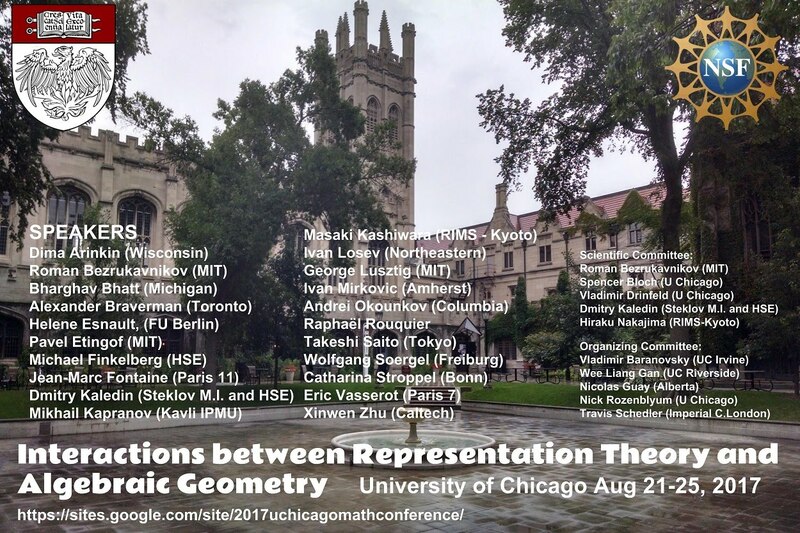 The conference Interactions between Representation Theory and Algebraic Geometry will take place at the University of Chicago from August 21 till 25, 2017. (Click here for the poster in PDF format.) The list of invited speakers and the members of the Scientific Committee can be found by clicking on the appropriate link on the menu on the left. If you are interested in attending, please complete the registration form. This conference is supported by the National Science Foundation and the University of Chicago. Financial support to attend the conference will be offered to some of the participants, with priority given to junior mathematicians (Ph.D. students and postdoctoral researchers). You can indicate your need for support on the registration form.